Yesterday, by registered mail from Turkey, I received a package from Rengin. It included my order of her oyas and oya trim. This is what I ordered. And this is what I got! 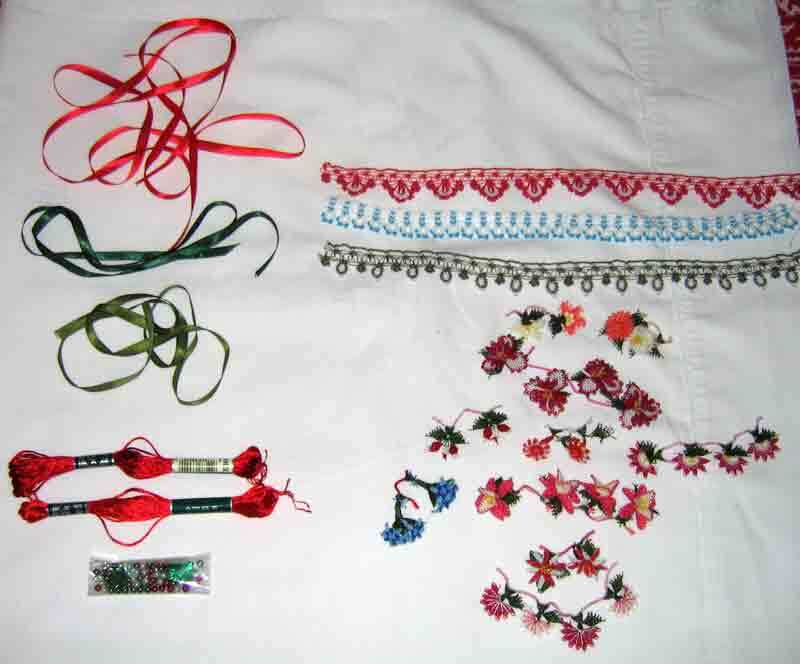 Gifts of ribbons, beads, and RED threads. She’s been reading my blog about trying to get the right red threads. These are great, and the gifts are so much appreciated. As my husband watched me opening the package and the baggies inside, he said, “You’ve gotten your money’s worth just in looking at them.” I agree. You can’t see the delicate lace work in my photos, so I hope you’ll go to Rengin’s sites. To get a better view of these exquisite needlelace creations, do go to her blog and to her photo album. Or to her Stitchin Fingers page. If you e-mail her at rengin03ist@yahoo.com, she’ll send you a pdf file of real close-up shots of what she has available for sale. Eye candy. Take a look. I found this information about traditional Turkish lace where you can also see close-ups of some oyas, patterns, and more information about their traditional uses. Anatolia’s thousand and one species of plants and gaily colored flowers are reborn in the imagination and inner eye of its women. The history of the decorative edging known in Europe as ‘Turkish lace’ is thought to date back as far as the 8th century B.C. to the Phrygians of Anatolia. Some sources indicate that needlework spread from 12th century Anatolia to Greece and from there via Italy to Europe. Traditionally, the headdresses and scarves women wore on their heads, the printed cloths, and prayer and funeral head coverings were decorated with various kinds of oya, which was also used on undergarments, to adorn outer garments, around the edges of towels and napkins and as a decorative element in many other places. In the Aegean region even men’s headdresses were decked with layers of oya. 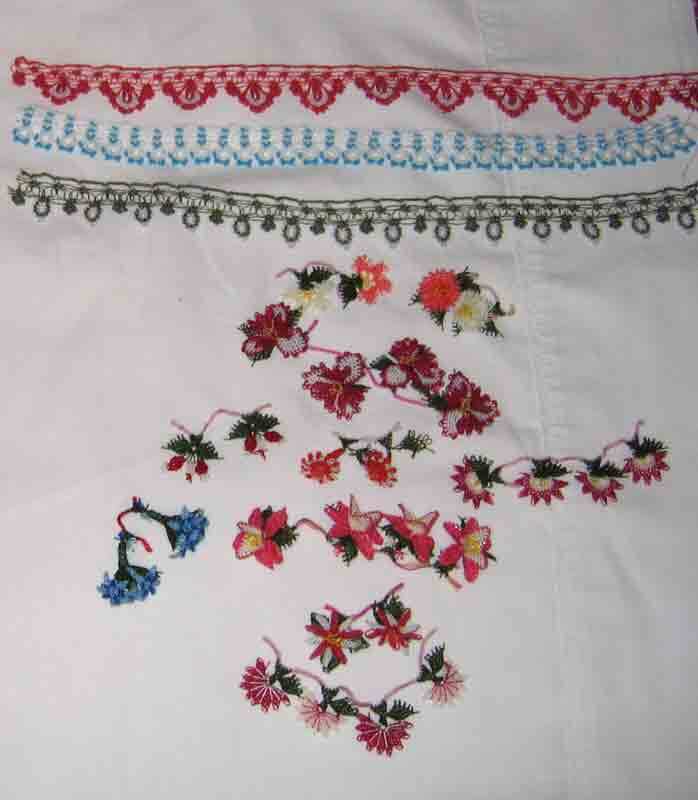 Oya edging, which appears all over Anatolia in various forms and motifs, has different names depending on the means employed: needle, crochet hook, shuttle, hairpin, bead, tassel to name just a few. Sewing needle oya is a variety that was produced by affluent, aristocratic, urban women. The most beautiful examples of such oya, which was usually made with a sewing needle using silk thread, were produced in the Ottoman Palace. Just look at your cluster map! Poor Australia has entirely disappeared! So has America and Europe! What a sweet comment from your husband. It’s good to remember the joy needlework (and all its pretties) brings us.